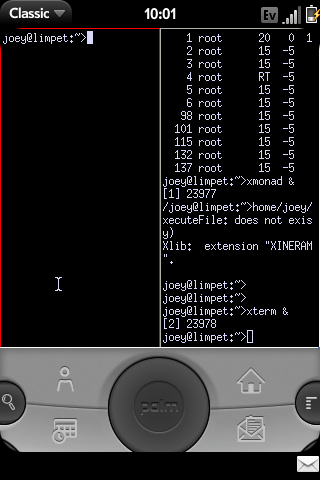 On my Palm Pre, I'm running a PalmOS emulator, with a VNC client in it, connecting to a VNC server on the same phone, in order to get to an xterm. About the most roundabout way to get a prompt on a phone one can imagine, and also very wasteful of screen space because of that PalmOS emulator. I hope better methods become available. Login as root to Debian chroot on the Pre. su to your non-root account on the Pre. Start Classic (or restart it). In Classic, select PalmVNC and tell it to connect to localhost, and change the display from 0 to 1. It will prompt for a password, just hit Ok for a blank one. Need way to send arrow keys! 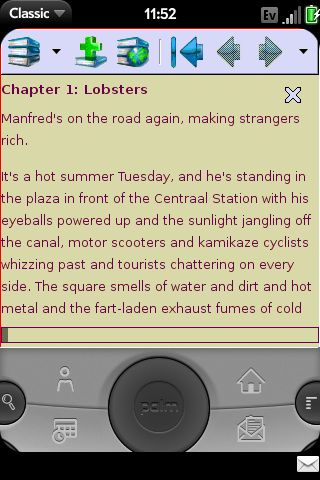 Update: Here's another screenshot, of FBReader on the Pre. One of the missing apps on the Pre is a good offline e-book reader with no vendor lock-in. FBReader is what I use on my laptop, so it's great to have it on my phone. Especially since I have room for my entire e-book library on the Pre's generous flash drive. Is that an expert of Accelerando by Charles Stross? Indeed it is Accelerando. I saw a broadsheet newspaper review of book readers on phones the other week and Accelerando was prominently displayed there, too (inside Stanza on an iPhone). releasing that book for free was a wise idea. I don't just want an xterm, see FBReader above. It's difficult to get passwordless ssh working. pssh doesn't support ssh keys; TuSSH does but I have not figured out how to get the key into the Classic emulator. What does the Palm Pre's native environment display to? I assume from the contortions of running a VNC server that it doesn't run X. Does it draw to a framebuffer? Or does it do something magic? Replying to my own comment: apparently the Pre uses the Linux framebuffer. So, in theory, you could potentially run an X server that talked straight to the framebuffer. You just have to get it to play nice with the Pre's GUI somehow.